WFR Course / WEMT module. 6-weeks. Starts Mar 5, 2019. Tue and Thu nights 6pm - 10pm. Dates: Tue Mar 5 through Thu April 11, 2019. Bonus valuable First Aid Kit FREE if you pay 30 days in advance for Full Class Registration (not deposit). Enrollment deposit holds your place in the class, balance due first day of class. If your WFR certification is out of date by 5 years or less, WMO can recertify you. 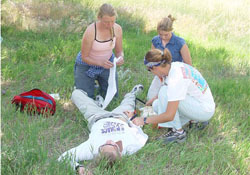 For details on WFR Re-cert, including Pre-Requisites, Books, etc. You will participate in a full WFR class. You are required to attend at least 24 hours of class time. You must successfully complete 4 scenarios if in 2 year expiration, 5 if in 3 yr, 7 if in 5 years and pass a written exam. Proof of WFR certification (WFR card) showing date. If you need to re-certify your Professional 2-person CPR (typically good for 2 years), you can do that as part of this course. You will need to be present on our CPR training and test session. If you cannot be present on the dates to re-certify in CPR, you will need to purchase our separate CPR course.